"All in a Day’s Run" is for competitive runners, fitness enthusiasts and anyone who needs a "spark" to get healthier by increasing exercise and eating more nutritionally. 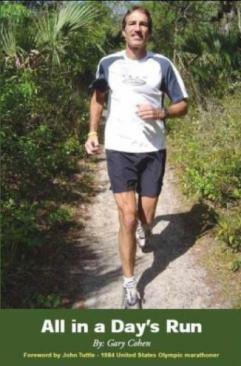 "Gary's experiences and thoughts are very entertaining, all levels of runners can relate to them." "Each of Gary's essays is a short read with great information on training, racing and nutrition." Half Marathons - Half the Distance, Twice the Fun! Celebrating Bogota — 20k Style! 10/21/08 The Mind - Friend or Foe? 9/15/08 Girls - Run with the Boys!